Cycling doesn’t have to be all about burning as many calories as possible whilst you speed up and down hills, it can be a way to relax, enjoy and tour your surroundings and sceneries whilst the sun is shining. Cruiser bikes are perfect for these casual sessions, not only do they look and feel stylish but they’re also a lot cheaper in comparison to road or mountain bikes. As cruiser bikes are built for comfort and for enjoyment of life, they typically will only have one speed meaning they are incredibly easy to maintain. Generally a cruiser bike will have extra wide tires, a thicker and studier bicycle frame and sweptback handlebars which all make for an easier relaxing bike ride. These beach cruiser bikes don’t have to be limited just the beach however, their excellent and simplistic build means that they are perfect for a short everyday commute also such as for the office. These bicycles offer increased stability and ease of use which means you wouldn’t end up at your destination tired and sweaty, but instead refreshed and relaxed from your calm commute. In general as with most bikes, beach cruisers in specific will have a lot in common but it’s a good idea to be aware of the following points and similarities in beach cruisers before you buy. Most beach cruiser bike frames are built from steel which make them heavier than your standard mountain or road bike, however this actually results in a more stable and easy to handle riding experience. As the bike is heavier it is less likely to wobble which offers the rider more control. However more recently some beach cruiser bike frames are being built out of aluminum which is much lighter in comparison to steel frames and makes it easier to ride across gravel and dirt trails with little effort. A wider tire on a beach cruiser is often referred to as a ‘balloon’ tire, this isn’t actually a bad thing as many people initially think. A wider tire means it will also be thicker, it is less prone to punctures and going flat meaning a beach cruiser bike is a lot easier to maintain than other bikes. A wide tire will also assist in offering the rider a more stable ride and moving back and forth across varying terrains easily. You can also ride across a sandy beach without sinking too deep into the sand with a wider tire on a beach cruiser bike, than you would with a traditional thin tire bike. With a beach cruiser bike, traditionally you will find that the handlebars and the pedals are a little closer to the rider than they are on mountain or road bikes. The reasoning behind this is that the rider will have less pressure on their back and be encouraged to keep an upright position as usually associated with cruiser bikes. This offers a much more chilled out and enjoyable riding experience without putting too much strain on the rider’s posture. Usually you will not have any gears on a beach cruiser bike, the purpose of these bikes are that the rider can have a simple relaxed riding experience as they travel across flat surfaces. Many people comment on how they are more aware of their surroundings and can appreciate the scenery around them more when they do not have to worry about switching up gears repeatedly. However as not all of us live on completely flat terrains, nowadays beach cruiser bikes are being developed which have between three to seven gears and are more suitable for those who have slightly longer commutes. A coaster brake works by the rider pushing back on the pedals as opposed to the traditional pulling on the brake handles. In comparison to the traditional brakes found on other bikes many comment on how easy coaster brakes are to use. A beach cruiser bike typically comes with a wider posterior saddle which is also accommodated with springs, this helps in smoothing out bumps and shocks from the road without disrupting the rider’s experience. This classic curvy built beach cruiser comes in a seventeen inch durable steel frame and aluminium wheels. The saddle is oversized and has dual springs to maximise rider stability and suspension with an added comfort of wide rubber grip handlebars. The Firmstrong Urban Lady Beach Cruiser Bicycle is available in two different sizes – 24-Inches and 26-Inches meaning it’s suitable for women between the height of 4 foot up to 6 foot.This bike was so popular that the manufacturers have released it in sixteen different colours schemes and also in single-speed, three-speed and a seven-speed versions meaning riders can enjoy more intense high speed riding up and down hills also. The bike is further customisable with optional accessories such as a bike basket, and you can adjust the handlebar frame to your height for added comfort. The price is highly reasonable and the bike comes more than 80% pre-assembled meaning you can assemble the entire bike and be ready to go within minutes! It doesn’t matter whether you plan to ride a bike regularly or just on special occasions, Schwinn 26″ Ladies Perla 7 Speed Cruiser Bike will definitely be a great asset. It can be your main vehicle when going grocery shopping or if you are going to the beach with a fully packed backpack. The body of this bicycle is more about safety. It has seven different speeds with a braking system. Steel constructions can hold more weight, so if you want to attach a basket to your bicycle, feel free to do so. Additionally, the rims are alloy, which again boosts the overall level of safety, and the high-quality tires can withstand almost anything. 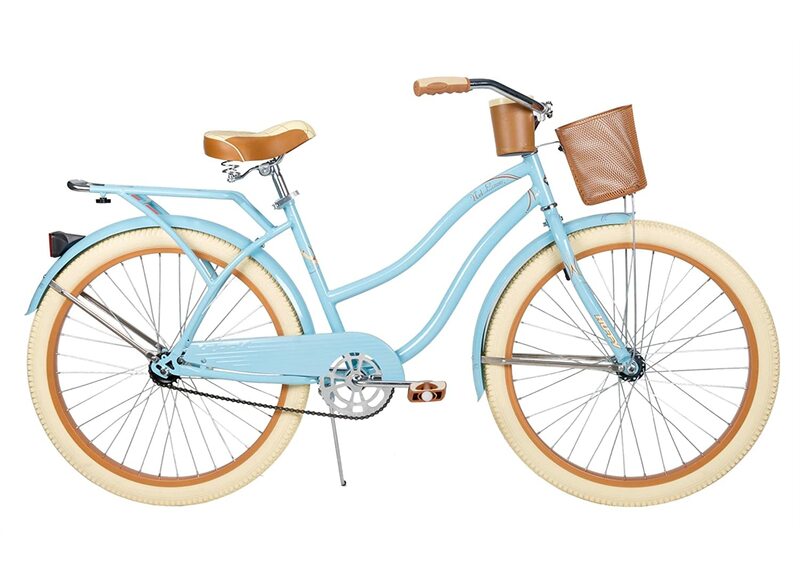 On Schwinn 26″ Ladies Perla 7 Speed Cruiser Bike, both wheels have their own classic fender which will keep its rider extra dry and safe from any dirt or worse. This bike also has an additional layer of padding inside the seat. This extra padding makes it even more comfortable and soft to sit on while riding. This lightweight beach cruiser is the style and comfort all put in one. It comes in eleven classical and feminine colours and with the option of single-speed, three-speed and seven-speed versions. It offers easy upright riding and isn’t complicated with any cables or complex gear systems either meaning it’s incredibly easy to maintain. The ergonomically placed seat and handle won’t put too much strain on your body. So feel free to go on a longer ride, with no fear of tiring too much. The Sixthreezero is also over 80% pre-assembled on purchase meaning very little assembly required by the buyer. It’s the perfect first bike at a reasonable price with high quality finishes down to the stitching on the saddle. The bike can be customised with accessory baskets and bells however it is a head turning beauty on its own. It is a lightweight product on its own which many riders have described the sensation of riding the Sixthreezero as if they are floating! Sturdy and safe, 26″ Huffy NelLusso Women’s Cruiser Bike is the best city bicycle for any type of women. It has a convenient basket and a rear holder for easier grocery or any other kind of luggage, transport. Whether you need a transportation vehicle to take you to your work or you like to spend your evenings riding across the countryside, this bike will surely be a great asset for you. Tires are 26 inches which are a cruiser type tires. Additionally, the rims are made from a specially made alloy to give extra protection against any type of weather. These tires are extremely durable, and will endure great amounts of mileage. Besides, this bicycle has many advantages in comparison to other models. The overall weight of this bicycle is around 20 lbs, which is really great since it’s meant for ladies. The front basket is already installed, so you don’t need to waste your time doing it yourself. The cup holder on the handle bar make you easily access to the beverage. Critical Cycles took a “less is more” mentality to the Chatham cruiser. Simple and functional, this bike is built for cruising and commuting with comfort at its core. Available in three gear options, Chatham transforms your every ride into a head-turning, envy-inducing, easy-riding cruise. The step-thru steel frame is hand-built and shock absorbent for comfortable and reliable riding, regardless of what you ride over. Cruiser handlebars are high to encourage a more upright riding position, reducing pressure on your back and shoulders. The Wanda Tires are extra wide for stability, grip, and shock-absorption. Plus, Double-Wall Rimsprotect the tubes in your tires from the spokes on your wheels, extending the life of your bike and its components. This bicycle weighs around 40 pounds, which is really light for a bicycle of these great features. Additionally, even though it’s lightweight it can carry over 150 pounds, so if you need to transport something with it, feel free to do that. It is obvious that Critical Cycles Chatham Women’s Cruiser Bike is a bicycle of a great value but still won’t cost you a fortune. It also provides all the ladies with an adjustable seat. Therefore, more women will find this to be the best choice. Womens Bike Reviews Copyright © 2019.